Doctors have found that many of the early learned habits of eating have an impact later on in life. For example, formula fed babies are more likely to deal with issues of obesity because, unlike with breastfeeding, infants are not able to stop eating when they are full. And parents are often tempted to push their babies to finish the bottle, which teaches the infant to overeat. A new study from Swansea University suggests that spoon-feeding and baby-led weaning may be rather similar to breast versus bottle when it comes to obesity risk. In it, scientists found that babies who fed themselves during the weaning process were less likely to overeat or be overweight as toddlers. 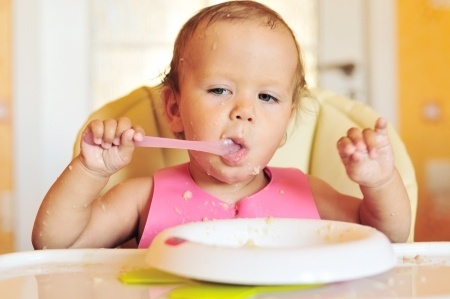 “There is an increasing recognition of the role of feeding style during infancy upon how a child’s appetite and eating style develops,” Dr. Amy Brown, from Swansea University, told The Telegraph. Dr. Brown and Michelle Lee, from the University’s College of Human and Health Sciences, compared the weights and eating styles of 298 babies. First they looked at how the infants had been introduced to solid foods between the ages of 6 and 12 months. Then researchers examined their weights and eating behaviors between 18 and 24 months. According to the authors, infants that had been weaned using the baby-led method were “significantly more” able to stop eating when they felt full. They were also less likely to be overweight and they tended to be less “fussy” when it came to feeding times and food preferences. Baby-led weaning is different from spoon-feeding in the respect that, rather than being given pureed foods by parents, babies are given a selection of food to choose from. The child has complete control over which foods to eat as well as how much they eat. “Allowing the child to regulate their own appetite and not pressuring them to eat more than they need is a really important step in encouraging children to develop healthy eating habits for life,” Dr. Brown said. The results were independent of other factors, including the mother’s background, birth weight, weaning age and whether or not the infant was breastfed.